Lindsay Lohan celebrates birthday number 20 today and in one short year, she'll be able to have her first sip of alcohol. Exactly. What's in store for the young "it" girl this year? TODAY'S BIRTHDAY (July 2). Romantic enchantment and exciting career developments make this a red-letter year. Events in the summer cause you to retrace your steps and land somewhere completely new by September. Additions to your family are featured in November. January brings a windfall. Capricorn and Taurus people are particularly supportive love interests. 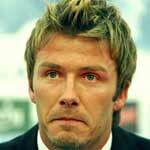 David Beckham stepped down as the captain of England's national soccer team today after a disappointing loss to Portugal. The New York Times reports that Beckham will continue to play on the team, but will step down as captain after a six-year run. His tearful goodbye speech proved that he's basically a verbally challenged townie who is best seen and not heard. Posh, meanwhile, had a nervous breakdown after England lost to Portugal, according to Dlisted. She lost those extra six pounds for NOTHING! What do you suppose happens in the Beckham house when daddy loses? He seems to prissy to be the type to get drunk and break things. He probably locks himself in an attic with a hairbrush and footage from old games. How long you think it'll be before Posh is knocked up again?